Technically, the Killdeer bird is classified as an upland shore bird. Most peoples introduction to this bird is a nest found in the middle of their driveway. To me; when I first see one of these birds at the local lakes I visit, I know Summer is on its way. 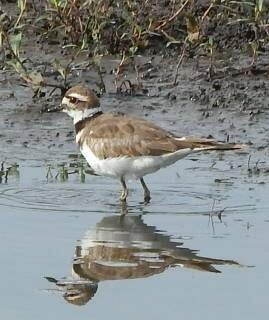 The Killdeer measures about 11 inches in length. Both male and female have two dark bands that stand out against a white neck background. These two dark bands make it distinctive from other North American Plovers. An orange to brown rump identifies this bird while in flight. A brown back and brown wings provide the camoflauge it needs when feeding and and nesting on the ground. Both male and female look similar. Juvenile birds also look like adults but the edges of their back and wing feathers are more buff in color. The young also have a single neck band while the adults have two. At their first prenuptial molt, the second collar band will show. This generally occurs in early spring. The Breeding time for Killdeer begins in March if they are in the south, while in Canada it can run into June before breeding begins. The male selects a nesting territory and may make several deppressions in the ground for future nesting. Courtship may include aerial displays in view of prospective females, bowing dances done on the ground near nest site selections also occur. The male is also well known for loud calling to attract females. The pair is monogamous during the nesting season and may nest tegether in successive seasons. The courship displays happen whether the pair have mated in the past or not. Up to 2 broods raised each season. Nest site habitat is varied. Even though they are shore birds, their nesting sites can be found away from water. Golf courses, short grass prairies, even rocky areas such as your driveway may be used to nest. Both adult birds participate in the nesting cycle. A slight depression is made in the ground which may be lined with pebble and grass. The female will lay from 3 to 5 eggs that are buff in color and heavily spotted or mottled. The average clutch size is 4 eggs. Incubation is provided by both adults and last about 24 - 28 days. This is longer than most backyard birds. This longer time is necessary for the growth of the chicks as they will leave the nest as soon as their down dries. The young are prewired to know what to eat and begin searching for food soon after they leave the nest. The young will follow the adults during this time. Of course, Killdeer are famous for their predator- distracting display. Other birds also use an "act of injury" to draw predators from nest sites also. This behavior usually includes dragging a wing on the ground drawing the predator away. When predators are far enough from the birds nest, the adult bird will fly away. Feeding mainly on insects, these birds diets include, mosquito larvae, beetles, fly larvae, grasshoppers and sometimes berries. Killdeer often nest in driveways or other areas around humans that may not be safe from harm. So, can you move the nest? The best thing to do is create a barrier around the nest site such as some type of fence. This may deter domestic cats and dogs from getting too close. The Migratory Bird Treaty Act states that it is unlawful to move an active nest of a protected bird. (the Killdeer is protected) As the author of this website, I have to point that out. I have known of people moving nest a few feet (5 feet) while the female was watching without nest abandonment. Others have shared that they've been able to move nest a few feet each day until the nest was out of danger. These particular nest were going to be destroyed if they had not been moved. I brought this topic up because I get this question a lot regarding this bird. Seems they're always nesting in someone's drive. While Killdeer have been recorded living 10 plus years, the average lifespan is 3 - 5 years.